Yufna Soldier Wolf teaches crafts at the Center of the West. What better way is there to celebrate the 43rd anniversary of Earth Day in 2013 than with a Family Fun Friday at the Buffalo Bill Center of the West (formerly the Buffalo Bill Historical Center)? On April 19, 3 – 7 p.m., the Center Celebrates Earth with activities that connect us to Mother Nature. This Family Fun Friday explores connections to nature found throughout the Center’s museums. Participating families enjoy crafts using natural pigments for paints, learn about endangered species, and take an “unnatural” hike through the Draper Museum of Natural History, discovering what NOT to do in taking care of the Earth and learning how to better care for it. 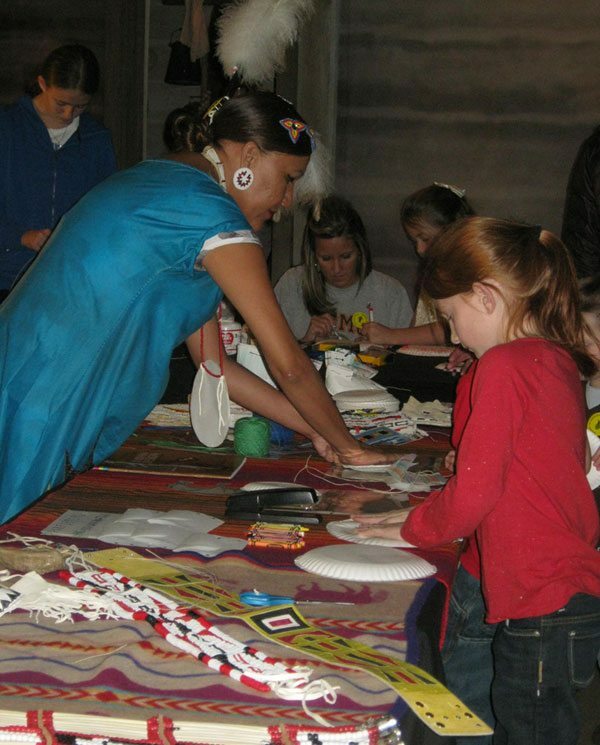 As the highlight of Celebrating Earth, the Center of the West also welcomes educator Yufna Soldier Wolf from Wyoming’s Wind River Reservation to share stories of how Plains Indian peoples connect to the Earth. The special event rate for Family Fun Friday is $15 per family, and families who are members of the Center enjoy a discounted rate of $10. A reasonably-priced, family-friendly dinner special is available for purchase during the evening. Families are encouraged to attend as a group and work together. With activities ongoing from 3 – 7 p.m., participants can drop in anytime to take part. For more information about all family programs at the Center of the West, please contact Emily Buckles at [email protected] or 307-578-4110, or visit the “Learn” section of the Center’s Web site. Starting in May, Family Fun Days move out to the Center’s gardens to take full advantage of summer weather: Upcoming dates are May 18, June 28, and July 27. Image: At the Buffalo Bill Center of the West’s April 19 Celebrating Earth Family Fun Friday, Yufna Soldier Wolf shares stories of how Plains Indian peoples connect to the Earth. Here she teaches crafts at a previous event at the Center.